You Will Be Seen On Time and…. My name is Dan Hines and I’m the owner and principle dentist at Azure Dental. I place you at the centre of everything we do here because at the end of the day it's your smile and healthy teeth and gums that counts. Azure Dental have been looking after the dental needs of you and the local community in Formby and Liverpool for a number of years now, offering a range of cosmetic dentistry treatments to suit your need. Dental treatments such as Invisible Braces & Clear Braces to straighten your teeth. Dental Implants that can replace your missing teeth and also provide an end to your troublesome dentures. Pain Free Dentistry or your money back, for nervous and phobic dental patients, letting you feel relaxed and stress free and most importantly, confident about seeing your dentist. In addition we offer all regular treatments and services that you would expect from your dentist to maintain your dental health and smile. 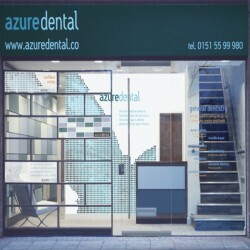 Furthermore Azure Dental offers before and after work appointments for busy Liverpool people and we also provide a "Free Smile Analysis" where you can visit us for FREE to find out if you are suitable for a fantastic new smile in a calm and caring environment.